The central locking button functions with the ignition switched on or off only when all doors are closed. If the vehicle has been locked with the vehicle key, the central locking button does not work. The indicator lamp in the button lights up yellow when all doors and the tailgate are closed and locked. 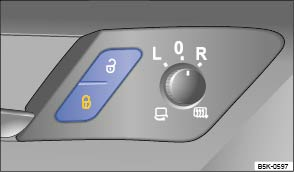 In vehicles with SAFELOCK mechanism: the SAFELOCK mechanism is not activated . The anti-theft alarm will not be activated. It is not possible to open the doors or tailgate from the outside, for instance when stopped at traffic lights. The doors can be unlocked and opened from the inside by pulling the door release handle. The indicator lamp in all doors switches off. You may have to pull the door release lever more than once. The unopened doors and tailgate remain locked and cannot be opened from the outside. The button is pressed . The vehicle comes to a standstill and the vehicle key is removed. One vehicle door is opened depending on menu settings in the infotainment system .